GREENFIELD, Mass. (AP) — Four inmates sit silently in the library of the Franklin County House of Correction one summer morning. But these men aren’t here to read books. Under the supervision of a nurse and two corrections officers, they’re taking their daily dose of buprenorphine. The drug, often known by the brand name Suboxone, is meant to control their heroin cravings and is commonly smuggled into jails and prisons. Scenes like this could be the future at more jails and prisons, as resistance from corrections officials long skeptical of the efficacy and high cost of administering opioid addiction medications appears to be loosening. Some 300 of the nation’s roughly 3,200 or jails and 1,900 prisons now offer some form of addiction medication to select inmates, according U.S. Department of Justice data. About 290 are offering a relatively new monthly injection of naltrexone known as Vivitrol to inmates shortly before they’re released, with many using free samples of the roughly $1,000 injection provided by drugmaker Alkermes, a company spokesman said. Only about 30 facilities widely offer the two other more proven federally approved medications for opioid addiction treatment — methadone and buprenorphine — but those numbers are growing, said Andrew Klein, a criminal justice analyst who has been tracking the programs. Correction facilities in Illinois, Ohio, New Jersey and Washington state recently launched buprenorphine programs, joining New York City’s Rikers Island, Bernalillo County jail in Albuquerque, New Mexico, and a handful of others that have provided methadone to certain inmates for years, he said. Franklin County, where 40 percent of its 220 inmates say they’ve used heroin, is so far the only correctional facility in Massachusetts widely offering buprenorphine. But state lawmakers this week approved legislation requiring medication-assisted opioid treatment at certain jails and prisons. 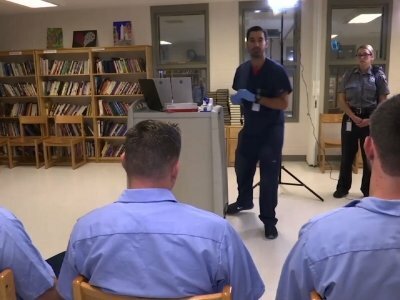 Neighboring Rhode Island and Vermont are already offering all three opioid addiction medications across its jails and prisons while Connecticut, which provides methadone at five of its facilities, is weighing a similar expansion, as is New York . And Los Angeles County, with one of the world’s largest jail systems, is also preparing to widely offer buprenorphine and methadone. Corrections officials have been slow to embrace addiction medications because many view them as simply substituting reliance on one drug for another. They also want the federal government to reimburse facilities for the costs. But reluctance is starting to fade with newer medications and more scientific evidence, said Elizabeth Gondles, of the American Correctional Association, a trade organization that accredits jails and prisons. The legal system could also end up forcing the industry’s hand. The American Civil Liberties Union recently sued correctional institutions in Maine and Washington state, arguing they’re violating the Americans with Disabilities Act by not providing the medications, and the U.S. Department of Justice has been investigating Massachusetts along similar lines. Since introducing buprenorphine two years ago, the Franklin County jail has treated roughly 240 inmates at a cost of about $12,500 per inmate per year. Sheriff Christopher Donelan notes that the county saw a 35 percent drop in opioid overdose deaths from 2016 to last year and suspects the jail program may be at least partly behind it. He is seeking funding for a formal study. Proponents note there’s years of research supporting the approach, including an April study that found Rhode Island’s corrections program contributed to a 12 percent reduction in the state’s fatal overdoses in the first half of 2017 compared with the same period in 2016. Much of Franklin County’s costs are for staff critical to the program’s success, including those screening incoming inmates and others providing behavioral health counselling and post-release case management, said Hayes, the assistant superintendent. For Ballentine, the Franklin County inmate released soon after taking his daily medication last week, that personal attention was critical. He had been hospitalized for three overdoses in as many months before his arrest for violating a restraining order and had every intention of using heroin once he got out of jail. “The staff here decided not to give up on me even when I decided that I wasn’t worth it,” Ballentine said shortly before being released following his nine-month stint. With his re-entry case worker at his side, Ballentine immediately checked in with his parole officer, picked up his buprenorphine prescription at a pharmacy and settled into a halfway home near the jail. A week later, he reports his doctor hopes to soon take him off the medication he’d been on for about two months in jail.